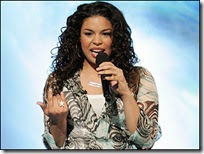 American Idol winner, Jordin Sparks, will sing the National Anthem at Super Bowl XLII! Since Arizona is Jordin’s home state and this is where the Super Bowl is being held this season, it only seems fitting. Although I think Fox is using this chance to cross-promote American Idol. Jordan's dad, Phillippi Sparks used to play for the Giants, but has never seen a Super Bowl. When asked by the Arizona Republic about how she felt singing for her Dad's former team, she replied, "It's really ironic because it's the Giants and it's in my hometown. I love football and to be able to sing at the game is a huge deal," Jordin said. "He (Phillippi) was like, 'At least one of us made it to the Super Bowl." Check it out...this 17 year old has a great voice. And don't forget to watch Idol Tuesday at 8/7c. Rock of Love 2- Episode 4- Crybaby!